eMagin says that it addressed the manufacturing issue - which did have an impact on production and deliveries early in Q1 2019 as well. eMagin also reports that it has made significant improvements in its technology and product design. The company demonstrated a color direct-emission OLED microdisplay with more than 7,000 nits brightness (eMagin's target is to reach 10,000 nits by the end of 2019 and 25,000 nits further ahead). By using superior OLED materials and improving the architecture, eMagin increased the efficiency and lifetime of its displays by more than 50%. eMagin says that it has received approval for its design from a Tier-1 consumer electronics partner for a prototype 4k x 4k OLED microdisplay. The company is working with a foundry partner to make the silicon wafers for this display, and aims to complete the display development in Q3 2019. 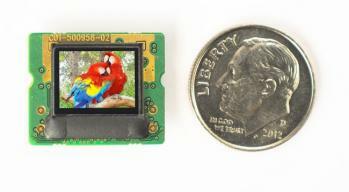 Finally eMagin finally announced that it is working on an OLED microdisplay to replace the current LCoS ones used in the F-35 fighter plane. The company, under contract from Collins Aerospace, has delivered the initial displays that are being installed in helmets for flight tests scheduled this year.